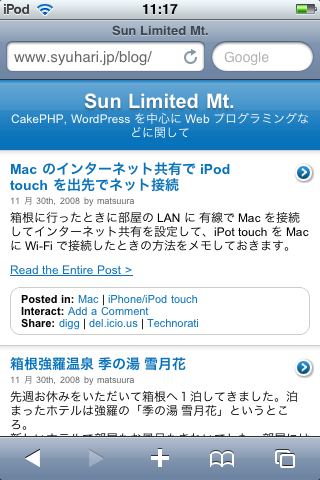 iPhone/iPod touch に表示を最適化するプラグイン iWPhone を入れました | Sun Limited Mt. This entry was posted by matsuura on 12月 2, 2008 at 11:32 am, and is filed under WordPress, iPhone/iPod touch. Follow any responses to this post through RSS 2.0. You can leave a response or trackback from your own site.